Supreme Master Ching Hai, upon hearing of Susie’s heroic and unconditional love for the tiny kitten and for saving his life, awarded Susie with the Shining World Hero Award and US$200 for vegan doggie treats. Other gifts included a beautiful pink doggie coat and scarf, and a beautiful new doggie bed. Susie’s caregiver Lynn Johnson also received Master’s animal books, DVDs, CDs and vegan chocolates. 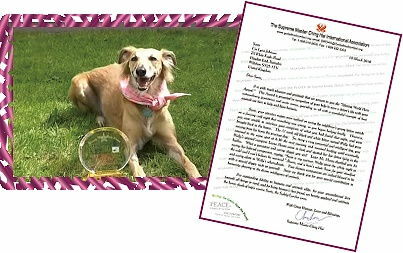 During the Award presentation which took place at her home on April 28, Golden Year 7 (2010), Susie appeared to be very excited. She munched on some of the doggie biscuits and proudly modeled her new scarf and coat. Ms. Johnson was very touched by Master’s wonderful gifts and kind gesture. 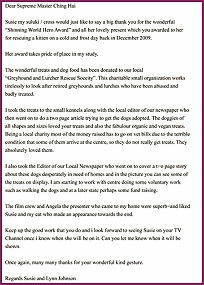 She noted in a thank you letter to Master that the extra dog food was shared with a local shelter and the doggies of all shapes and sizes loved the treats. We celebrate the heroic deeds of super canine Susie. Thank you for showing us the divine intelligence of animals. May you enjoy many happy hours with kitten Welly and your loving caregivers.